I love getting comments from my readers. Every now and then I get a really interesting one, like the one from Sue which I have quoted below. 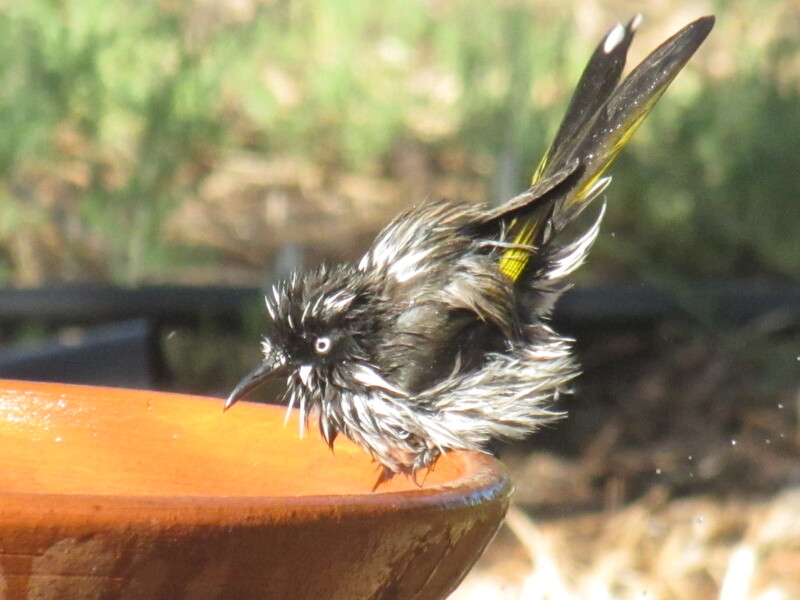 I’m in suburban Adelaide, and I put a second bath into the garden when the hot weather struck early in the season. We have always had a terracotta pot pond with water lilies that allows for the bees to drink as well having a strong enough rim for some of the larger birds. The other two are just very large terracotta pot saucers, one on the ground, the other now in a raised garden bed under a deep shade tree.The ring neck dove (Spotted Turtle-dove) nested and fledged a chick in a hanging pot under the verandah.. Much cooler than her previous nest . Blackbird got it wrong and build a nest behind the fence post on the support rail .. But the iron faces west and is only shaded part of the day. She sat the nest for a full week before abandoning it, I suspect it was far too hot once the sun tracked round. Unfortunately, mid year, the neighbours had removed the large shrubs many of them had been using. The New Holland honeyeaters, the Blackbird and the Wattlebirds have all now learnt to associate me out watering with a wet foliage cool off. The honeyeaters will actually make a fuss until I wet the bamboo down to make a cool and safe retreat then happily make use of it regardless of how close I am. I suspect they may nest in the bamboo next year as its big enough to be a stable thicket. All of them love it when the old fashioned rain wave sprinkler is put on. They all seem to be learning new tricks to cope with the extra heat … with a little help from their friends. Thank you, Sue, for sharing your delight in the birds in your garden. If any of my readers would like to also share their experiences with birds in gardens – or other places for that matter, please leave a comment here on this article, or any article for that matter. You never know – I may feature your experiences in an article so everyone can read it. 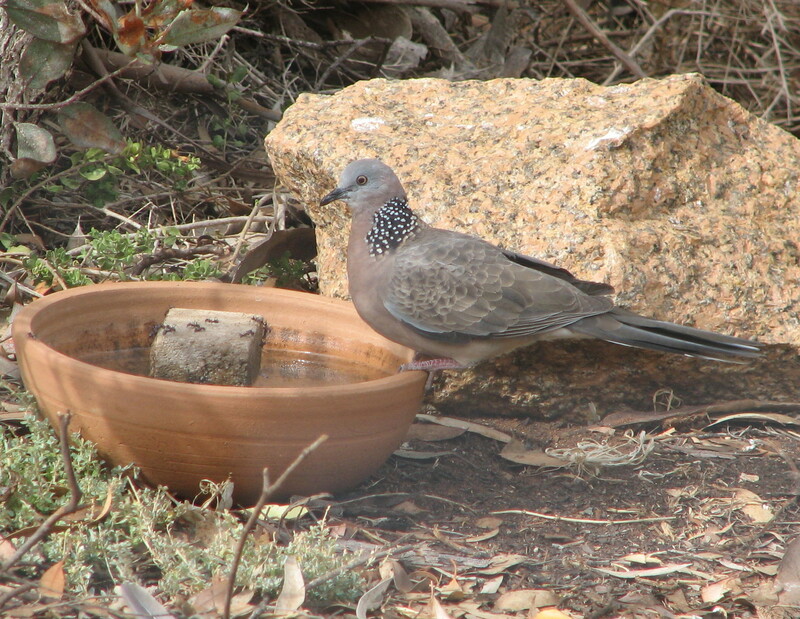 Below I have included a few photos of birds at our bird baths. 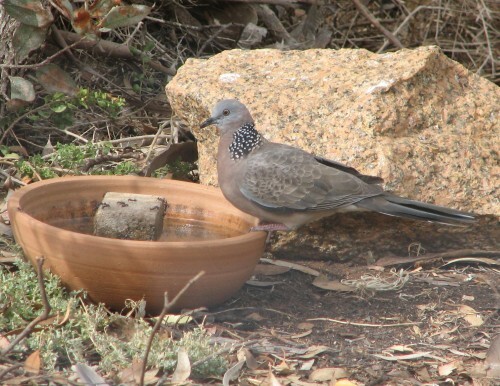 Time for a bath – an article about birds and other animals which have visited our bird baths. Over recent posts here I have featured some of the birds I saw on a visit to the Western Plains Zoo near Dubbo, New South Wales. As we were leaving several peacocks strutted past us in the car park – all for the world like they owned the place. I have found that this is a common trait in this species of bird. 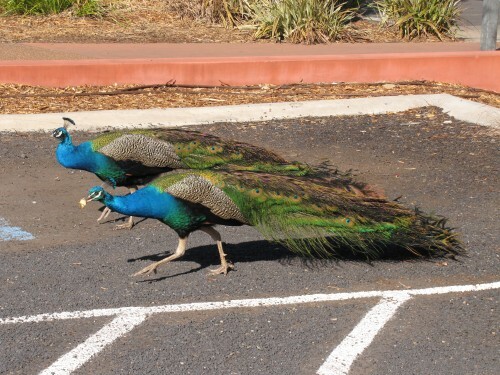 I should give this bird it proper name: Indian Peafowl. 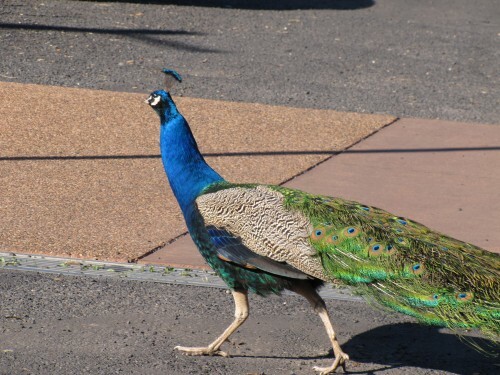 Most people I know will call it a ‘peacock’, but that is more correctly the name given only to the male. The female is called a peahen. The birds shown in today’s post are all males. This most colourful and charismatic of birds is an introduced species in Australia. The species is native to India and Sri Lanka. 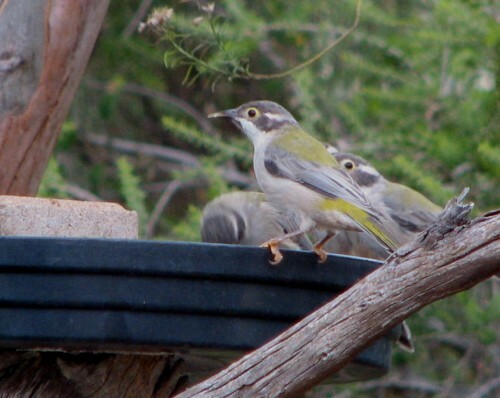 Small feral populations exist in many parts of the world, Australia being no exception. They are a common adornment in zoos, parks and gardens in many parts of Australia. Last week I had a medical procedure in a hospital in North Adelaide. The procedure – an endoscopy and a colonoscopy – went well and nothing nasty was found, though the lead up to it was challenging. Being on a fast for 25 hours was testing, as was the mixture one has to take to purge one’s alimentary canal, but I survived to tell the tale. On my way to the hospital we had to pass Elder Park on the banks of the Torrens River immediately to the north of the CBD. 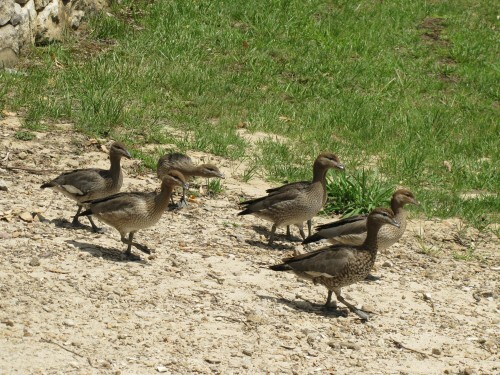 This wide expanse of lawned area was being occupied by hundreds of Australian Wood Ducks, all grazing on the grass. I was driving so I was not able to get an accurate estimate of the numbers, but it seemed to be at least 200 or more. And I didn’t have my camera either, so here is a photo of a family of Australian Wood Ducks taken at the Mt Annan Botanic Gardens in Sydney. On our return from a recent holiday in Sydney we were having lunch on the back veranda. 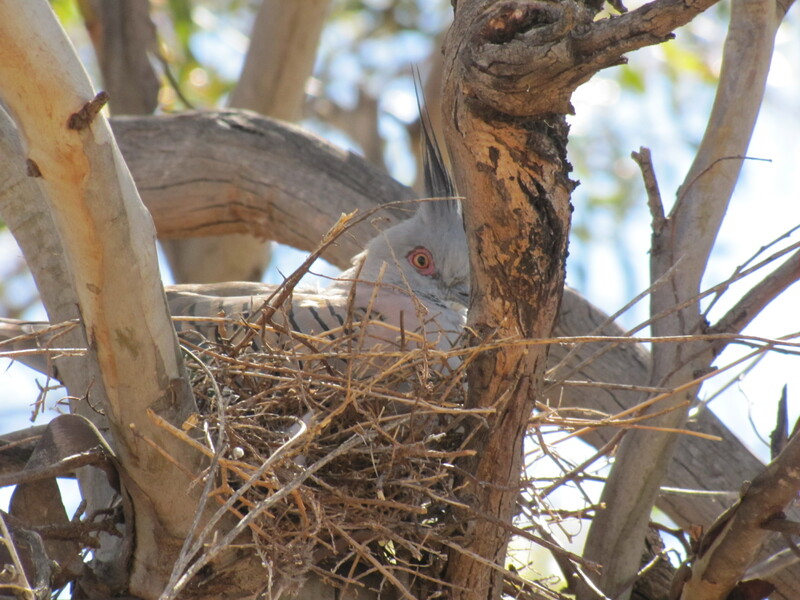 I was watching a Crested Pigeon fussing about in a tree about twenty metres away. Next thing it settled down as if on a nest. I left my food – actually I think I was at the cuppa stage of the meal – and moved slowly and carefully towards the nest. I’d remembered to go inside to get my camera first. Sure enough – the pigeon was sitting on a nest. Crested Pigeons are very common around Murray Bridge. At times I have counted up to 50 sitting perched on power lines, often in a row. It’s quite a spectacular sight, though it is not common to see so many at one location. Loose groups of 5 to 15 are quite common, however. Crested Pigeons are what I call a resident breeding species, meaning, they are resident all the year and that they breed in our garden. The nest shown in today’s photos is quite a substantial nest for a pigeon. Most pigeons and doves are not fastidious or elaborate when it comes to nest building. They seem to think that a dozen or so flimsy sticks placed at random in the fork of any tree or bush will do as a home for their chicks. How the eggs don’t fall through some nests I’ve seen is amazing. Still, they seem to manage; there are a lot of them around! My writing of this post was interrupted by the load of washing finishing, and I am the one in our household who usually does the washing. 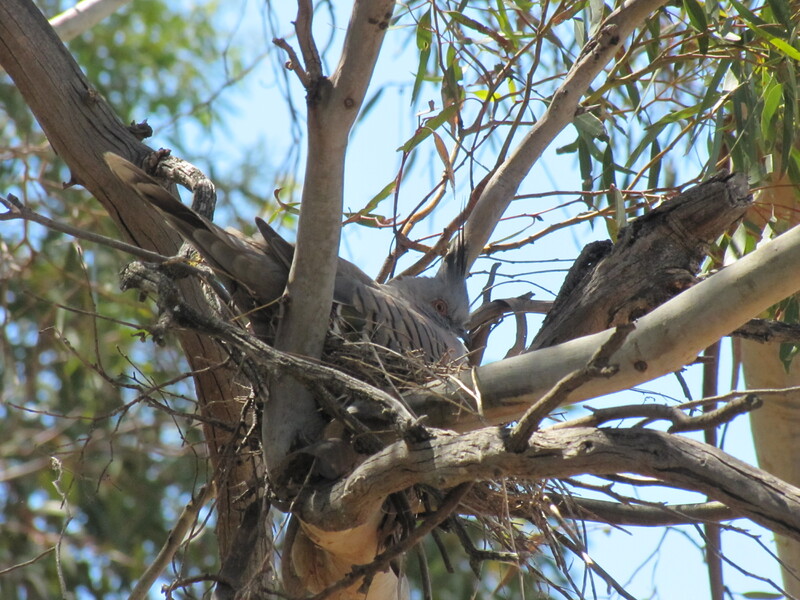 The pigeon’s nest is near the clothes line and the bird is sitting tight, even when we walk within a few metres of the nest. She must have eggs, I think. I will keep a watch on proceedings. UPDATE: January 22nd: over the last week we have had a heatwave with five days over 42C with several over 45C (113F). This was followed by several days of wild wind which broke several branches off our trees. The nest is still there but appears to have been abandoned.